Corner of Edson and Main Street, Eldred. 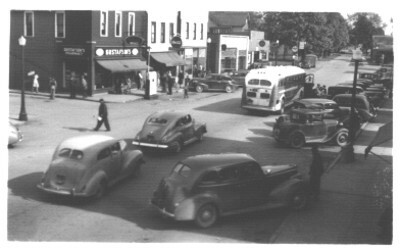 In 1926, Tom Todd and Adolph Berg started a partnership with Ford Motor Company at the corner of Edson and Main Street. 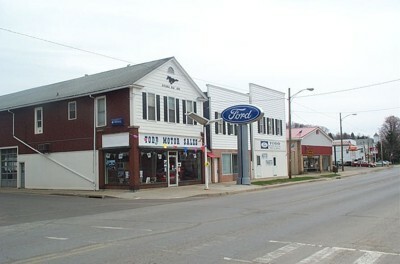 Located behind the Meat Market, Todd and Berg started this Ford garage in the former location of Burr's Chevrolet garage, which moved to the corner of Railroad and Main Street after demolishing the St. Elmo Hotel. 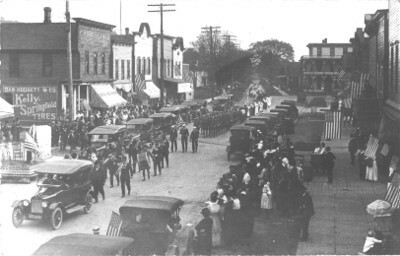 Gustafson's Drug store also occupied the front of the building and the corner was a busy stop for many years too. In 1936, Tom Todd bought his partner's interest and named it Todd Motor Sales. In 1946, he and his sons, John and Phil, both World War II veterans, formed a partnership. In 1952, both Tom and Phil died and John Todd became sole owner of the garage. Today his sons, John Jr. and William Todd run the family business. Over the last 75 years the business suffered from floods and fires, but business goes on. 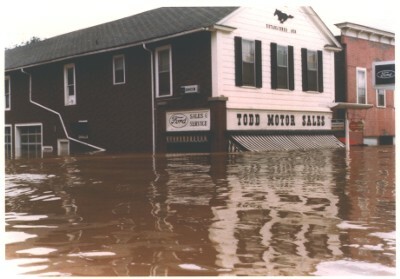 The most tragic flood being that of 1972 when 13 feet of water flooded Main Street at its peek. A fire in 1973 destroyed an annex building across the street which sold motor homes. The family business also sold Fordson tractors at one time.